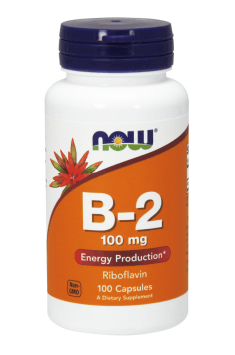 Now Foods B-2 is a supplement containing high-quality vitamin B2 (riboflavin), which is responsible for the proper processing of many crucial reactions and metabolic changes in the organism. The preparation supports the functioning of the nervous system, cardiovascular system, improves immunity, takes care of vision and also facilitates energy production and supports migraine treatment. The preparation is recommended to supplement vitamin B2 deficits, which may occur in the cases of applying improperly balanced diet or low-energy diet, intestinal absorption disorders and also in the case of the increased needs for riboflavin – the period of intensive growth, pregnancy and lactation, old age, intensive physical activity and stress. Riboflavin belongs to the group of vitamins soluble in water. The substance fulfills a role of the precursor for coenzymes and takes part in many key reactions in the organism. Vitamin B2 is absorbed in the upper part of small intestine and around 1/3 of its supplies is stored in the liver. For the regulation of riboflavin transformations in the organism i.a. thyroid hormones are responsible. Vitamin B2 naturally occurs in plant and animal products. Its richest sources are milk and dairy products, meat, eggs, yeasts and whole-grain products as well as legumes’ seeds and avocado. Riboflavin belongs to enzymatic compounds called flavoproteins - flavin mononucleotide (FMN) and flavin adenine dinucleotide (FAD), thanks to which it plays an important role in oxidoreduction, protein, fat and carbohydrate metabolism and it also takes part in producing energy in the respiratory chain. FMN and FAD also take part among others in the transformations of retinol to retinoic acid, vitamin B5 and folic acid to their active forms and alpha amino acids to ketoacids. Moreover, vitamin B2 is essential for the proper functioning of the nervous system – both central and peripheral, plays an important role in the process of vision, takes part along with vitamin A in maintaining proper functions of mucous membranes, digestive tract mucosa, skin and blood vessels epithelium as well as supports the immune system. Weakened mitochondria work may be manifested by migraine. Riboflavin, being a component of FMN and FAD, which are responsible for i.a. ATP synthesis in mitochondria, reduces the frequency of migraine headaches and also shortens their duration. Proper supply of riboflavin may have the influence on the proper amount of hemoglobin. It was observed that vitamin B2 supplementation in the case of diagnosed deficits resulted in the improvement of hemoglobin in blood. Vitamin B2 positively influences the state of the cardiovascular system. Scientific research show that riboflavin may contribute to lowering the level of homocysteine, which is a development factor of atherosclerotic changes, coronary heart disease, myocardial infarction or stroke. Increased riboflavin need is observed among others in the maturation period, pregnancy, lactation, increased exposure to stress and performing intensive physical activity and its deficit may be caused by improperly balanced and poorly varied diet (low supply of milk and dairy products), excessive alcohol use and smoking, respiratory system disorders, diabetes and old age. Vitamin B2 deficit is manifested by inflammatory changes of the mucous membrane of oral cavity and tongue, seborrheic face changes, cracked lips and vision disorders (worse vision, hypersensitivity to light, lid redness, wrinkles) as well as disorders of the nervous system functions. Summing up, Now Foods B-2 is a dietary supplement that effectively supplements vitamin B2 deficits and satisfies the organism’s needs for this ingredient in the situation of increased need. Moreover, the preparation may be used preventively and alternatively in the states of skin inflammations, tendencies to develop angular cheilitis, worse vision, diabetes, after antibiotic therapy and in the periods of decreased energy, increased stress and physical activity. Vitamin B2 has a limited ability to absorb in the digestive tract, therefore overuse is not observed, thanks to which its supplementation is safe. Vitamin B-2 100mg 100 caps. Scientific studies have shown that taking vitamin B2 decreases the incidence of migraine attacks. To reduce migraine attacks, a suggested dose is 400 mg of riboflavin per day taken for up to 3 months. It has been observed in other studies that also a lower dose can be effective which is 25 mg a day. It is thus recommended to start supplementation from a smaller dose (one capsule a day) to reduce the frequency of migraines. It is advisable to avoid taking supplements with alcohol because it can impair ribofllavin bioavailability.